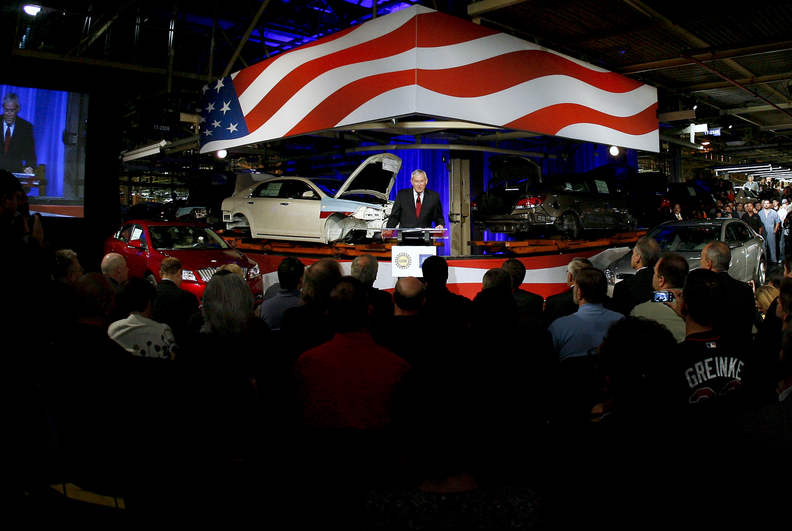 CEO Ed Whitacre said last month in Kansas that GM's early repayment of $5.8 billion in U.S. government loans was a sign that the automaker's “plan is working.” Today, GM said there's a "good chance" for a full-year profit. DETROIT (Reuters) -- General Motors Co. posted a first-quarter profit as production snapped back and said it was making progress on a turnaround expected to put it on track toward its first full-year profit since 2004. Analysts said the results underscored the progress GM made by slashing costs in a bankruptcy funded by the Obama administration and kept open the prospect of the automaker launching an initial public offering as soon as this year. GM recorded a net profit of $865 million, compared with a loss of $5.98 billion a year before, as it ramped up production by nearly 57 percent from year-earlier levels to meet steadier demand in the United States and a sales boom in China. "Now that we have achieved profitability, the next step is to achieve sustainable profitability," CFO Chris Liddell told reporters. Liddell said GM had a "good chance" of making a profit for all of 2010, although gains from ramping up production would fade after the first quarter. He declined to offer a forecast for the rest of 2010. He also put some conditions on the timing of a possible initial public offering. In addition, GM Controller Nick Cyprus cautioned that GM must further refine its internal financial controls before company managers have a clear view of financial performance. He expressed optimism that would be accomplished before an IPO. GM received $50 billion of U.S. government financing for its restructuring in bankruptcy. It has been aiming to launch an IPO that would allow the U.S. government to reduce its stake of nearly 61 percent in the automaker. First-quarter revenue was $31.48 billion, a 40 percent advance from a year earlier, when GM was on the brink of bankruptcy after collapsing U.S. demand sent the industry into a tailspin. The automaker generated $1 billion in free cash flow during the quarter and said it ended the period with $35.7 billion in cash. GM's first-quarter global sales rose 23 percent to nearly 2 million vehicles, including sales of GM's affiliate brands in China: Wuling and FAW-GM. GM used bankruptcy to drop brands, cull U.S. dealerships and reduce debt. At the end of the first quarter, GM had debt and preferred stock of just over $20 billion, down from $54 billion a year earlier with government creditors taking the place of bondholders. "The promise of the bankruptcy was to reduce costs, and it worked. That bodes well for the future," said John Wolkonowicz, an analyst with IHS Global Insight. GM posted a $4.3 billion loss in 2009, from the time it emerged from bankruptcy in early July until the end of the year. The automaker fell into bankruptcy after losses of about $88 billion from 2005 through the first quarter of 2009. Analysts have said GM still faces steep challenges in repairing the reputation of its brands led by Chevrolet in its home market. Another area of weakness is Europe, where GM posted a first-quarter loss of $506 million and sales for its Opel and Vauxhall brands were down almost 1 percent. "They're headed in the right direction, but one quarter is not going to turn the ship around," said Mirko Mikelic, a portfolio manager for Fifth Third Asset Management. GM's market share was stable at 11 percent of global sales and at about 18 percent of North American sales. IHS Global Insight's Wolkonowicz said the results showed GM was in a stronger position than its smaller rival, Chrysler, while still lagging Ford Motor Co. Ford posted a $2.1 billion first-quarter profit and has forecast that it will be solidly profitable for 2010. In a step aimed at strengthening its ability to compete with rivals, GM has been looking at options to re-establish a captive auto financing arm, people with knowledge of the plans said last week. Such a move would mark a nearly complete reversal of the process that started in late 2006 when GM sold off a controlling stake in GMAC to raise cash. Detroit-based GMAC, now known as Ally Financial, is 56 percent owned by the U.S. Treasury after the government injected $17 billion as part of a restructuring that also saw the finance company become a commercial bank. Liddell said it was "incredibly important" for GM to have a strong financing partner but said it was "debatable" whether that needed to be a captive finance firm as GMAC once was. Reuters, Jesse Snyder and Bloomberg News contributed to this report.